It is possible to convert artwork in a bitmap layer into vector outlines, which you can then edit and paint using Harmony's vector drawing tools. This procedure takes the bitmap drawing in the layer's line art layer, then converts it to vector outlines and inserts them into a vector drawing layer, which you must create as your destination layer for the vectorization. NOTETo do this, your bitmap drawing you should be line art only, and it should be in your drawing layer's line art layer. In the Timeline view, create a new vector drawing layer, and make sure it is listed right below your bitmap drawing layer. If it is not, drag and drop the vector drawing layer below the bitmap drawing layer to reorder it. 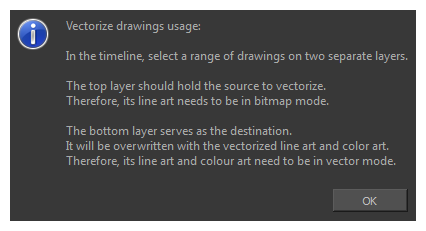 On the right side of the Timeline view, select all the bitmap drawings you vectorize, along with the frames in the vector layer which should serve as a destination for the vectorized images. Right-click on the selected frames, then select Drawings > Vectorize Line Art in Selected Drawing. In the Vectorization section, select a vectorization preset. 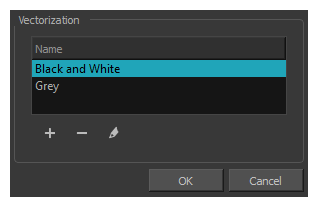 Among the default presets, you can select Black and White if you wish to make crisp, vector only outlines, or Grey if you wish to preserve your line art's texture. You can customize your own preset using the Add or Edit buttons—see About Custom Vectorization Parameters . Your bitmap drawing layer's line art is vectorized and inserted into your vector drawing layer. Click on the Enable/Disable Layer icon next to your bitmap drawing layer to hide your bitmap line art and see your vectorized line art. For this functionality to work, your selection must absolutely have frames from a bitmap drawing layer on top, and frames from a vector drawing layer in the bottom, and nothing else. Otherwise, an error message indicating how to use this feature will appear.